A sumptuous blast of sweet fruit flavors further delivers a good-for-you portion of soy protein. Our newest recipe begins with Vanilla Pleasure™ as a foundation and then adds layers of fruit: fresh cranberries, raspberries, strawberries and orange sherbet. Cool down with this tart blend on a hot day, or treat yourself with this decadent combination any time of the year. NOTE: For an even colder smoothie, let sit in freezer for 10-15 minutes. 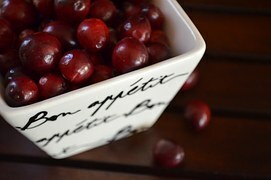 Enjoy the added benefits of cranberries with this low-calorie blend.